Cagle continued to build his catalog of original material and honing his composing and arranging skills while Nash went on to study studio recording and production under non other than Mark Williams, Engineer on projects of R.E.M, Don Dixon, James Brown fame while pursuing his day gig as Marketing Manager for a B2B manufacturer in the Charlotte area. Cagle and Nash still kept in touch on a close friendship level but were not afforded the opportunity to write and record together again until . . . This album is about as soulful as they come and will show you influences as varied as Donald Fagen (and Steely Dan), Michael McDonald, Marvin Gaye, John Legend, Michael Buble. And with guest appearances by Robyn Springer and Di Yonna Mitchell you are going to hear some Mysa, Dion Warwick and Roberta Flack influences. Bottom line is this could be one of the most talked about new releases in the Soul genre a long time. It is classic soul without being dated. Fresh and exciting yet soulful and singable. And most definitely danceable. Cagle & Nash is on Facebook! RadioIndy is pleased to announced that we have published our CD Review of Cagle & Nash music to Facebook. RadioIndy is pleased to present Cagle & Nash with a GrIndie Award for the CD "Soul Complete"
Cagle & Nash serve up some delightful, easy listening R&B/jazz songs on their newest release “Soul Complete.” This delectable disc features a collection of well written lyrics of love lost and found while showcasing lead vocals that are solid and well polished. The music flows with style and never falters while delivering the sounds of blues and the relaxing, fresh touch of R&B. An outstanding horn riff highlights “December” while the flute adds a soft and graceful touch. Another track which emphasizes the horn is “Information” as the solo is clean and crisp. Take note of the smooth and dynamic balance of harmonies with guest female vocalists on songs such as “Anywhere You Wanna Go” or “And Suddenly.” If you like the songs of Steely Dan or Michael Buble, then “Soul Complete” is the next album you will want to hear. Cagle & Nash Press Release on Digg.com! "Soul Complete" Reviewed by RadioIndy.com! 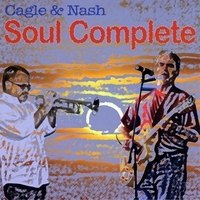 Cagle & Nash serve up some delightful, easy listening R&B/jazz songs on their newest release “Soul Complete.” This delectable disc features a collection of well written lyrics of love lost and found while showcasing lead vocals that are solid and well polished. The music flows with style and never falters while delivering the sounds of blues and the relaxing, fresh touch of R&B. An outstanding horn riff highlights “December” while the flute adds a soft and graceful touch. Another track which emphasizes the trumpet of Rick Nash is “Information” as the solo is clean and crisp. Take note of the smooth and dynamic balance of harmonies with guest female vocalists on songs such as “Anywhere You Wanna Go” or “And Suddenly.” If you like the songs of Steely Dan or Michael Buble, then “Soul Complete” is the next album you will want to hear.